The first wearable for the visually impaired has been created by a new South Korean start-up company in the form of the Dot braille smartwatch. The braille smartwatch is equipped with four sets of six dots, which raise to produce four braille characters at a time informing the wearer of information, time, notifications and more. Until now, if you got a message on iOS from your girlfriend, for example, you had to listen to Siri read it to you in that voice, which is impersonal. Wouldn’t you rather read it yourself and hear your girlfriend’s voice saying it in your head? 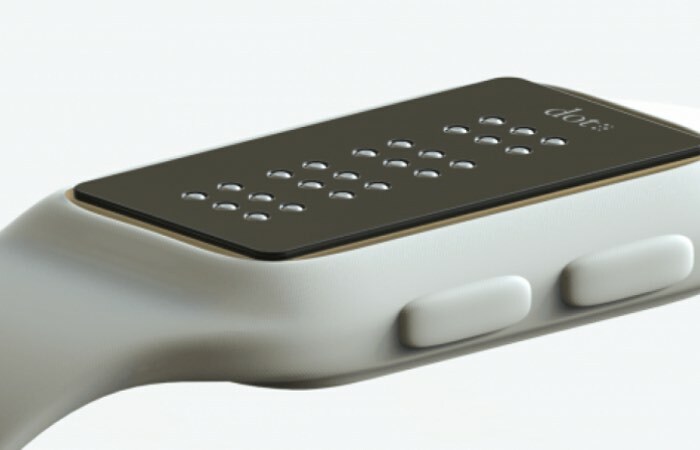 The Dot braille smartwatch is expected to be made available during December throughout the US and is expected to be priced at around $300. As more information becomes available we will keep you updated as always.More details in the meantime jump over to the official Dot website here.